Nouar LA-based painter & designer. Inspired by mid-century Americana and food has linked up with Martian Toys to release a vinyl art collectable! 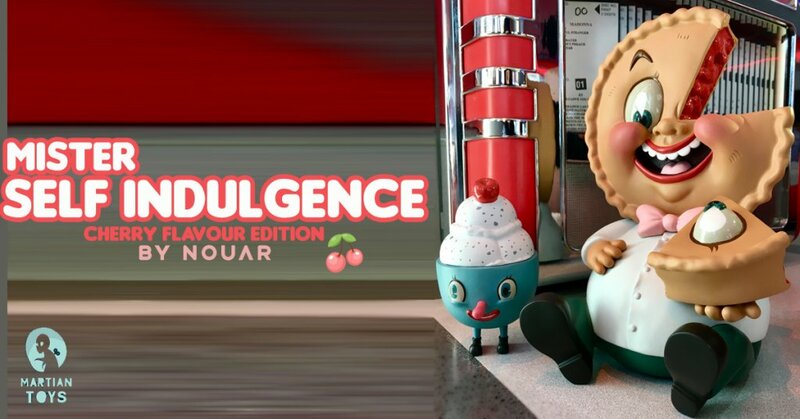 Nouar x Martian Toys presents to you Mister Self Indulgence! Cherry Flavor Edition. From painting to a fully fledged vinyl production! Martian Toys and Nouar should be proud how Mister Self Indulgence turned out. Judging from the photo below its pretty much a true representation of the original painting but in a 3D vinyl form. Martian Toys has landed in Thailand for Thailand Toy Expo and Mister Self Indulgence will be making his world premiere at Thailand Toy Expo Thursday, May 3 (this Thursday!) Don’t cry too much if you can’t make it to TTE as Martian Toys hasn’t ruled you out. Find Nouar via Instagram and Etsy.